Finding the right bat for your BBCOR High school or College league can be a daunting task. There are many options in the marketplace all with various attributes that can benefit different types of hitters. For this article, we’re going to take a look at the newly introduced line up for 2017 from one of the leaders in the industry, Easton. Many who use Easton bats become loyal to the brand, so whether you’re looking for the new best thing from them, or considering the brand for the first time, this post will have some great information for you. As an industry leader in baseball bats since being the first to introduce aluminum bats back in 1969, Easton has enjoyed almost four decades of being the innovator coming up with the next best thing. Some of their first to markets include having the first titanium, carboncore, and scandium bats and they’re always adapting their designs to reduce swing weight and increase the size of the sweet spot for some really great power options. Though not the cheapest in the field for sure, they do offer options at a couple different price points, and you know you’re getting what you pay for when it comes to this brand. Their new line up for 2017 should be no different. Below, we’ll look at what Easton has introduced for their new generation of BBCOR bats. For any unaware, BBCOR stands for Batted Ball Coefficient of Restitution. It is a regulation standard that calculates how much energy is lost when the ball comes in contact with the bat. The higher the number in this area, the more trampoline effect it creates. BBCOR rated bats are bats approved to be used in high school and college games. There are a variety of materials that can be BBCOR – aluminum, composite, or wood are all utilized. Another key aspect is that they’re designed as a “Drop 3”. This refers to the numerical difference between the length, in inches, and the weight of the bat, in ounces, being three. Below is a quick chart to see where we feel each of these Easton models land when it comes to power over contact. This is by no means official, just based on standard assumptions when it comes to the preferences of each type of hitter. Take a look and hopefully, armed with this visual and the reviews and information we provided, you’ll find the best bat for you! The first bat we’ll look at is the 2017 Easton Mako Beast. This may be out of the price range for some, but if it is in your budget, it’s the one to look at. The Mako, being the most popular in the series, is priced at around five hundred bucks. This is a two piece bat, fully composite material, and features an improvement in balance over the 2016 Mako XL. If you’re comparing it to the 2016 Beast, it’s longer – giving it an even broader sweet spot – and they’ve changed up the look so the cosmetics are different. If you’ve got the 2016, this may not be enough of a change to run out and buy the new model, unless you really want to take advantage of the longer barrel. I have named this the best overall bat, and it’s even beat out others at a higher price range. This bat feels lighter than most in its category so you have great control. The very low sting factor feels great, and the thin handle allows for great grip. This is definitely the one we’re most excited about out of the new Easton line up! The next bat from Easton for this coming calendar year is the 2017 Easton Z-Core XL. This is a cost savings over the Mako and has the same aluminum barrel found in every bat within the Z-Core line. This is currently the only one-piece, end-loaded bat on the market. It gives you great ping off the ball and has the longest barrel of all the varieties we’re looking at, this just means you have to be good with a little sting and feedback off the ball. It is a great selection for power hitters because you’re guaranteed to get a lot of distance with the mass this bat puts behind each swing. It would be important to have your mechanics in a good place as this bat isn’t very balanced. As with the Mako, the ZCore XL has Easton’s 1.2mm HYPERSKIN grip for added comfort and control. This bat has the highest swing-weight index out of all 2017 bats in the Power Brigade Lineup and one of the heaviest swinging sticks per bat length currently on the market, the swing weight is estimated to be about 20% more than the Mako. There aren’t any significant changes between this and the 2016 version, but if you’re going to get it, be sure to purchase it new. Aluminum is not a good material to get in a used bat, so you want to unwrap this out of its original packaging to get the best result. This bat will come in BBCOR only, so if you’re not in a BBCOR league you can get more pop with another version, but otherwise, this is an excellent choice for a seasoned power-hitter that knows what they’re doing and can handle the weight of this barrel. The 2017 Easton Z-Core Speed has only minor cosmetic changes over the 2016, but on its own, lives within a very unique space in the BBCOR market. As a single piece, fully alloy bat, this version combines a large barrel with lighter swing weight. Estimated to be approximately 10% lighter than the Z-Core XL, the Speed has the second lowest swing weight index in the BBCOR Power Brigade while still having the largest length barrel there is, so you’re not sacrificing the size of the sweet spot. This bat will give you more balance than the XL since the balance point is closer to the knob. You’ll still get the occasional sting so as a hitter you’ll want to be good with some feedback after each hit, but if you’re looking for a single piece, the light swing weight of this one, helps it outshine other similar models from different manufacturers. This of course also has the HYPERSKIN grip Easton is known for and it’s hard to go wrong with the Z-Core technology. Once again, with any aluminum bat, you want to be sure to buy this new, so shopping used is not something we’d recommend. If you’re a power hitter that likes more speed from a lighter weight option, this is a great choice for you. It’s important to be solid in your mechanics, as with any single-piece, there is slightly less balance than with a two-piece, but would be the better alternative over the Z-Core XL and has the same price point. If you love the Z-Core Speed, but want something with a bit more flash, there is the option of the 2017 Easton Z-Core Whiteout. 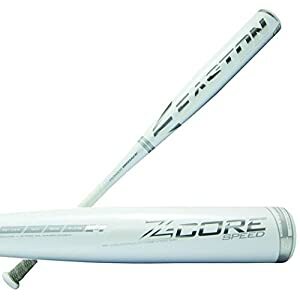 This is the identical bat to the Z-Core Speed but with white and chrome graphics. You get the “Ping with Every Swing” as Easton says of its Z-Core line, but now with a little differentiation in the color and design. A nice way to set yourself apart before even making that first hit. This bat is the same price point, as the regular Z-Core Speed, and the specs are the same as well. It gets dirty quickly, but people who have used it says it still looks good once it does. Last of the new releases, we have the 2017 Easton Z-Core Hybrid. Like the Z-Core Speed and the Z-Core XL, this bat has the same barrel but once again, the balance point is closer to the knob, like with the Speed, so you get slightly more balance. This is the only two-piece design in the current Z-Core line. 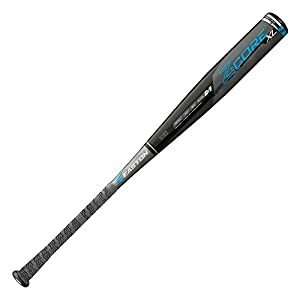 This bat has a whole lot of fun features associated with it to combine most of the benefits of all the bats in the Easton line, and is priced right in the middle. This bat features the Aluminum barrel of the Speed, with the added balance and lower swing weight of the Z-Core series, but has the same Composite handle of the Mako. Easton’s patented ConneXion technology maximizes the transfer of energy for great feel. Speaking of feel, this bat also incorporates SIC black carbon for the handle which eliminates negative vibration. This bat has the second highest swing weight in the BBCOR Power Brigade Lineup and although quite balanced, is slightly more end loaded which is a bit of a difference over the 2016 Z-Core Hybrid and the 2015 S2Z. The only other difference is aesthetics. There is slightly less power in a two-piece, however the pop off of the Aluminum, when compared to the Composite barrel of the Mako, or other lines, is felt by many to be much better. Aptly named “Hybrid” this bat from Easton lands in the middle of their line up in more ways than just price. This won’t be as light as the Mako, or as heavy swinging as the XL, but you won’t be sacrificing anything with comfort or size of the sweet spot. A great pick for contact hitters, but not a bad option for a power hitter looking for more balance and a more comfortable grip. Once again, the Easton line is looking great and picking the right bat for you is really up to the personal preference of the hitter. While most power hitters will lean toward a one piece, and more contact hitters preferring a two-piece, there is enough variety and great technology in each of these Easton bats to keep you hitting at the top of your game. Anything with Z-Core will give you the biggest sweet spot, and the longest aluminum BBCOR barrel in the market, along with a massive hitting surface, but the uncharacteristically light weight of the Mako is impossible to beat when it comes to balance. Overall, from 2016 Easton didn’t make many significant changes to their line, so you can expect the same great performance with an updated design. Finding comparable models by other manufacturers comes down to your price sensitivity and what features you’re willing to sacrifice. We’re loving the Easton line against the competition this year.